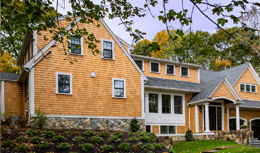 Residential Construction | Shoreline Builders Inc. Whether you are planning to build a new home, remodel an existing home or build an addition - the experienced and trusted team at Shoreline Builders is up to the task. We collaborate with our clients to develop innovative and creative solutions to create beautiful living spaces that will surpass your expectations. We have earned the trust of our clients by consistently providing thoughtful design, well-managed projects and spectacular results. We offer a complete design-build program or we can work with your architect or existing plans. We can get your project going whether you're just starting the process or have plans and are ready to get building. High performance home building is a design and construction approach that utilizes a rigorous set of building standards to construct homes that are years ahead of today's “code built” houses. These homes provide an extremely tight building envelope, are super insulated, use the most energy efficient windows and doors available and utilize mechanical ventilation to provide healthy indoor air quality. High performance homes are designed to be comfortable, healthy, durable and energy efficient. Learn more HERE.